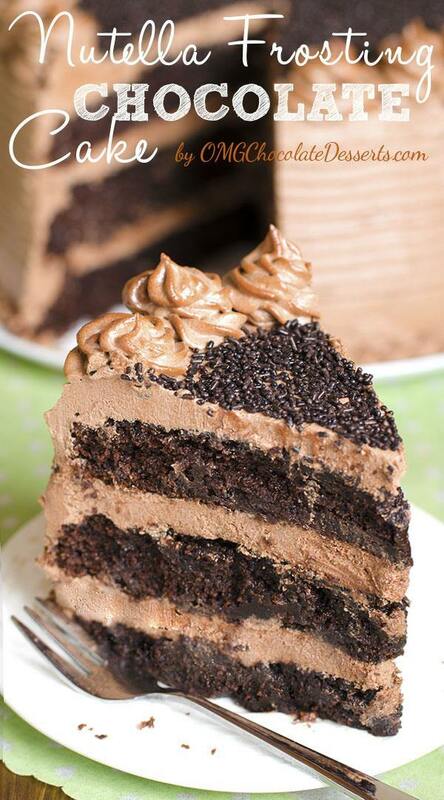 Decadent Nutella Chocolate Cake – moist, rich and super chocolaty cake frosted with rich and buttery Nutella frosting . A few days ago it was my mom’s birthday and as always, when it comes to celebrations in my family, desserts are my responsibility of course. The birthday girl didn’t want to choose to much, the only demand was for the cake to be with chocolate. Even though everyone in my family loves my OMG Chocolate Chocolate Cake, I don’t want to repeat myself too much, so I decided to make a little change. I baked the cake by my good old recipe which had never failed, but I wanted to try a new frosting. 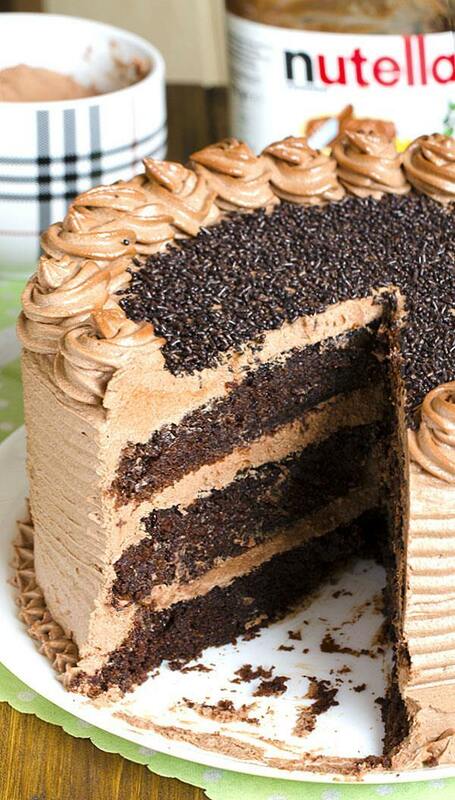 After a search through the internet, I chose “Best Ever Nutella Layer Cake” by Sweetepolita. That frosting looks really magical, silky, shiny and already at first site, you can see that it’s very tasty. It’s the best possible dessert for a special occasion like a birthday. According to the original recipe all ingredients for the frosting are placed in a food processor and pulse until smooth and glossy, about 1 minute and the frosting should be very soft. Well, since I always have to change something, first I went the „classic route“ and beat up the butter and sugar with a mixer, and then added the rest of the ingredients. Since I didn’t have dark chocolate, I put semi sweet baking chocolate, and in the end, my frosting was nothing like the one in the picture. I was so disappointed. Well, that’s what I deserve when I always have to experiment something! My frosting came out really dense instead of airy and shiny. But, everyone makes mistakes. Next time, I will try to stick by the recipe and I’m sure everything will come out just fine. Just to avoid a misunderstanding, for the guests, my Nutella Chocolate Cake was absolutely delicious. Mom was satisfied, many of the guests wanted another piece and some of mom’s friends even asked for the recipe. It looks as if I’m my own harshest critic. Preheat the oven to 350°F and grease three 8 inch round baking pans and line the bottom with parchment paper. Divide batter into 3 prepared pans and bake 25-30 minutes or until toothpick inserted in center comes out almost clean. To make the frosting melt 11 oz chocolate and let it cool to a room temperature. Beat the butter and sugar until it’s light and fluffy, then add chocolate, nutella, vanilla and salt and mix well. Add sour cream and mix it well to combine evenly. To assemble the cake place a dollop of frosting on the plate, then place the first layer and spread about 1 1/2 of frosting over the cake,. Repeat the process with the other two layer and cover the cake with frosting. 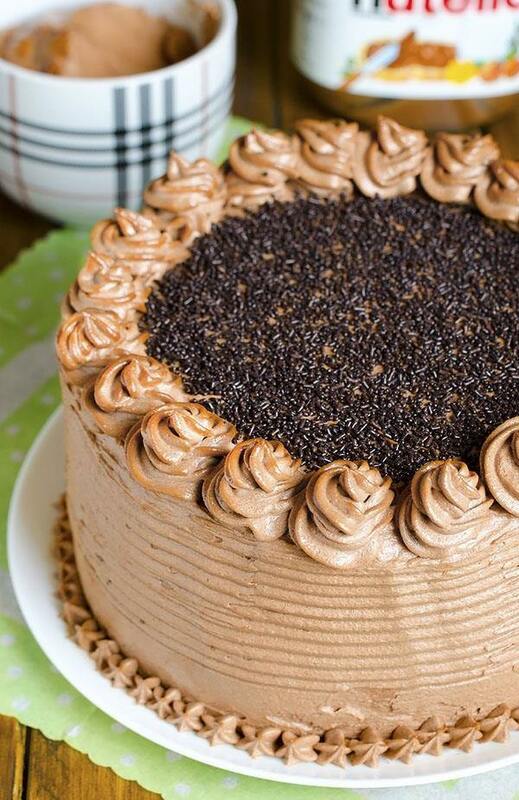 Garnish with chocolate sprinkles. Store in the fridge. Is the sour cream necessary?? What is it gd for?? Hi Sherine, it’s not necessary, you can add a few tablespoon heavy cream if the frosting is too thick. But I like it better with sour cream, because the frosting is really rich, sweet and buttery and sour cream makes the perfect balance. Could I use yogurt instead of sour cream?we don’t get sour cream here.pls cud u let me know ASAP.am dying to make this cake.looks soooo delish.thank u.
Hi Shradha, I think it won’t work well with yogurt. I don’t know what kind of yogurt you have but I think it won’t be the same. kindly tell me how to mke sour cream? Sonia Malik, I am sure you can use plain whole fat yogurt instead of sour cream. I’ve used it in place of sour cream many times with success:) Just use the plain so there’s a bit of tang to it. Hi Jessica, 1 cup=237 ml and 1 oz=28 grams, 1 teaspoon is 5 ml, I hope this helps, now you can do the math. Ithanks for your help bit ts better if i buy the measuring cups because its not easy and i font want to mess it up.the salt is required in the recipe? 1-3/4 cups all-purpose means 1 cup and 3/4 of a cup? Yes you’ll need salt but just a dash. And yes it’s 1 cup and 3/4 of a cup. Hi I made this cake and it was supermoist delicious.but only complaint about the frosting.they told me that it was too rich too sweet.is there any option maybe decrease the amount of icing because i did the recipe like yours.? Hi Jessica, you could decrease the frosting for 1/3 or as much as you like and use less sugar if you wish. This looks beautiful, completely delicious, and extremely well suited for World Nutella Day tomorrow!!! Can I use olive oil without using vegetable oil. Hi Gyni, you can use it. If I use salted butter would that matter and should I just omit the pinch of salt? Hi! This cake looks amazing! I was thinking of making it for a party and I was wondering if it would work as cupcakes or will the batter be too runny? And other than adjusting for baking time, will I need to make any other changes? Thanks! Can’t wait to try it! made this is brilliant best chocolate cake recipe i’ve ever used, would this cake work as a non chocolate, if you just omitted the cocoa powder, and is the boiling water there just for the cocoa?. Thanks Tim, boiling water makes the cake moist, but I don’t know how it would work without the cocoa. Let’s just say…if you had a cookbook with recipes and pictures like this, I would have to buy it so I can sit and lick the pages. OMG Thank You! Can this be baked in 9×13 cake pan? Hi Monica, I think it could work but you’ll need to bake it longer. I have made this cake for my boyfriend , and he absolutely loves it!! He even requested it for his birthday this year. I have to make 2- one to take to family and one for him at home. Great recipe! !